A new Genetic Health Risk Report for G6PD Deficiency* looks for one genetic variant linked to episodes of anemia. The G6PD Deficiency report provides information on whether a customer has a variant called Val68Met, which can lead to defects in an enzyme called glucose-6-phosphate dehydrogenase, or G6PD. This report is particularly relevant for customers with African ancestry, because Val68Met is the most common variant linked to G6PD deficiency in people of African descent. The G6PD enzyme helps protect red blood cells from damage. People with G6PD deficiency often have no symptoms unless they are exposed to certain factors — such as certain medications, infections, or foods (like fava beans) — that can result in the destruction of their red blood cells. If too many red blood cells are destroyed, this can lead to episodes of anemia, which can be characterized by symptoms such as dark urine, fatigue, pale skin, shortness of breath and more. The G6PD gene is found on the X chromosome. Because of the way this gene is inherited, men are more likely to have G6PD deficiency than women. About one in ten African American men is affected by this condition. 23andMe’s test doesn’t diagnose G6PD deficiency. Rather, it detects the most common variant linked to G6PD deficiency in people of African descent. This variant can also be found in people who are only partly of African descent, including people of Hispanic or Latino descent. In people with no African ancestry, the variant is rare. 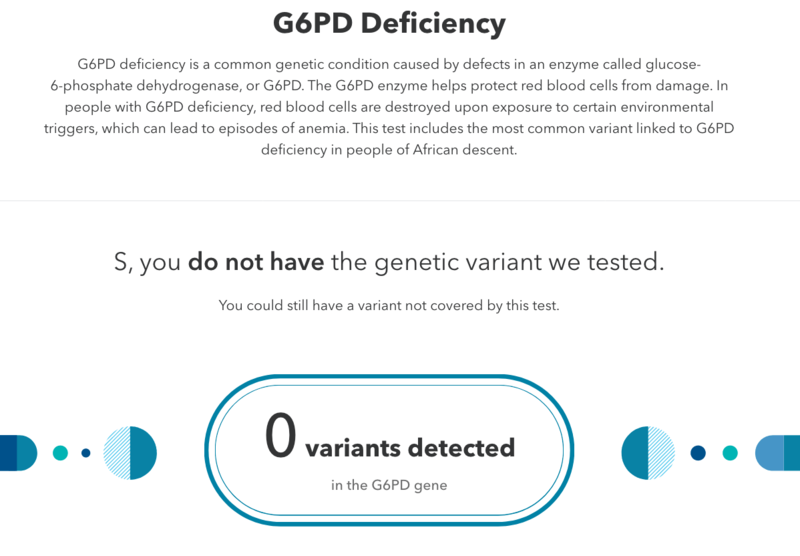 G6PD deficiency also impacts people with Mediterranean, Middle Eastern, and Asian ancestry, but 23andMe’s test does not include other G6PD variants that are more common in people of those ethnicities. The National Institutes of Health estimates that about 400 million people worldwide have the condition. 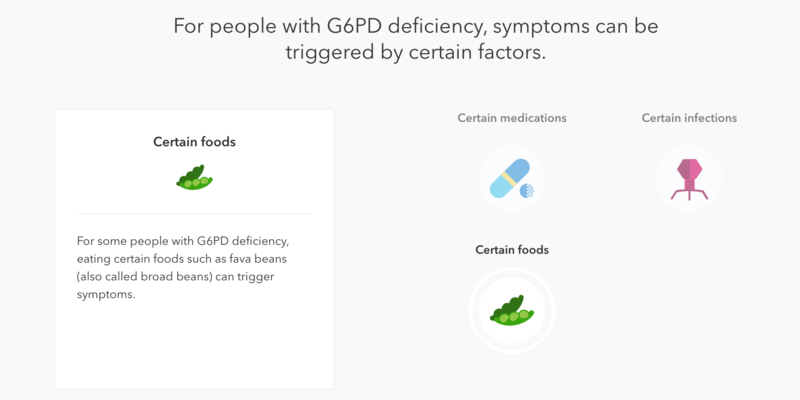 23andMe’s new Genetic Health Risk Report for G6PD Deficiency* is one of nine Genetic Health Risk reports now offered to new and existing Health + Ancestry Service customers. 23andMe’s Genetic Health Risk reports are the only direct-to-consumer genetic health risk reports authorized by the FDA. *The 23andMe PGS test uses qualitative genotyping to detect select clinically relevant variants in the genomic DNA of adults from saliva for the purpose of reporting and interpreting genetic health risks. It is not intended to diagnose any disease. Your ethnicity may affect the relevance of each report and how your genetic health risk results are interpreted. Each genetic health risk report describes if a person has variants associated with a higher risk of developing a disease, but does not describe a person’s overall risk of developing the disease. The test is not intended to tell you anything about your current state of health, or to be used to make medical decisions, including whether or not you should take a medication, how much of a medication you should take, or determine any treatment. The G6PD Deficiency genetic health risk report is indicated for reporting of the Val68Met variant in the G6PD gene and describes if a person has a variant associated with G6PD deficiency and an increased risk for episodes of anemia. The variants included in this report are best studied in people of African descent.